1. What are different methods of passing paramaters in OAF? 2. Explain structure of setForwardURL method. functionName – This is the function name representing the page you want to forward to. If its null, an IllegalArgumentException will be thrown. Also if the function is not under the current HOMEPAGE a OAException will be thrown. OAWebBeanConstants.KEEP_MENU_CONTEXT: Keeps the menu context as is. OAWebBeanConstants.KEEP_NO_DISPLAY_MENU_CONTEXT: Keeps the menu context as is, but will not display all menus including global buttons. OAWebBeanConstants.KEEP_NO_DISPLAY_MENU_CONTEXT_RETAIN_GLOBAL_BUTTONS: Keeps the menu context as is, but will not display all menus excluding global buttons. OAWebBeanConstants.GUESS_MENU_CONTEXT: Selects the given functionName function if it exists in the current menu. If not it will try to make a guess by moving up the menu tree until it finds it. An exception will be thrown if the function could not be located. OAWebBeanConstants.RESET_MENU_CONTEXT: Reset the menu context to the given functionName and menuName. menuName – The name of the HOMEPAGE menu to reset the Menu context to when the menuContextAction is OAWebBeanConstants.RESET_MENU_CONTEXT. If the menuName is not of type HOMEPAGE a OAException will be thrown. You can pass null otherwise. It will first get the function’s corresponding URL call by querying the function information from the database. If the user is not authorized to execute this function, a security OAException will be thrown. It will then append all parameters passed in the parameters HashMap. First parameter added to the HashMap will be first added to the URL. Also the framework will encode all parameter values before appending them to the URL. It will remove all parameters if they have null values in the passed parameters HashMap. This provides an easy way for developers to set a certain parameter’s value to null if they want to remove it. It will remove any OA Framework internal URL parameters such as bcrumb, retainAM, and so on..
retainAM – If true, all the cached application modules will be retained. If false, all the cached application modules will be released. Developers must use this parameter to control the release behavior of the cached appplication modules. //Set here your unique attribute values, I'm setting here Supplier Id as for every new row it should be different. 4. What for isPreparedForExecution() and executeQuery() methods used? 5. What is the pattern used in developing any OAF component? 6. If we have to initialize something during the page loading, which is the right place? A. ProcessRequest() method of the Controller file is the right place. 7. What is the significance of ProcessFormData()? 8. Does ‘GET’ request result in calling ProcessFormData()? 9. How does page structure get created at runtime? 10. Where does the client BC4J objects get placed in the server? 11. Where does the server BC4J objects get placed in the server? 12. Where does the Page and Controller related files get placed? 13. What are Validation View Objects? 14. What is the version of Jdeveloper to be used in 11i or R12? For 11i, Jdeveloper 9i will be used and for R12 Jdeveloper 10g will be used. 15. What is a Database Connectivity(DBC) File? 16. What is the object passed to every page request? OAPageContext object is passed to every request, using this object the controller initializes the application module object and will call the required methods. 17. Where is the view object(VO) initialization or query filtering done? 18. What is the property to set for an AM so that the transaction state is maintained across pages? RETENTION_LEVEL property is set to value MANAGE_STATE for an AM. 19. Give some examples of Page Personalization? 20. 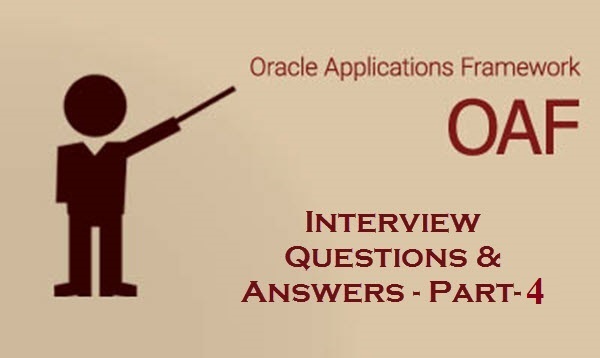 How to do register a new OA Framework page in Oracle Applications? 21. How do you move personalization from one machine to another? 22. What are the different layers of onion reuse object model in OAF?